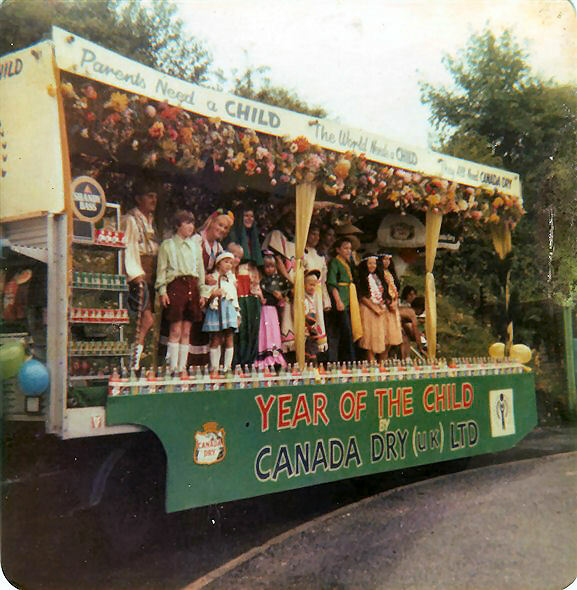 This carnival float was sponsored by Canada Dry (UK) Ltd for the Year of the Child in 1979. Do you remember this particular year? Maybe you remember seeing the float. You might even have been on it, or know someone who was? If you can tell us more about it, or identify any of the people, please leave a comment below. Although I can’t tell you anything about this float, I do remember it taking part in the 1979 carnival, because we, (Brighton Police), also had a float in the same parade depicting 150 years of the Police. We won second place in our category. I believe they also won a prize. For many years the Brighton Lions Carival was always a grand annual event, attracting anything up to about 80 floats, but sadly by the early 1980s it started to get smaller and less spectacular. What I remember particularly about this Carnival was that although it was in August, it was bitterly cold and poured with rain throughout, but the streets were still lined with crowds of people. Decorated car at Brighton Carnival 1923.